Achieving health equity requires collaboration, coordination, and collective action. The Mobilizing for Action through Planning and Partnerships (MAPP) process can help communities develop a culture of continuous collaborative health improvement that can guide them through this process. 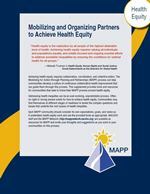 This supplement to the MAPP User’s Handbook provides tools and resources for communities that seek to frame their MAPP process around health equity.